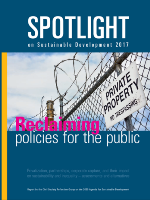 Global spotlight report challanges the notion that "trillions of private finance" are needed to advance SDG implementation. "We don't need 'trillions' to achieve the SDGs"
The Spotlight Report is published by the Arab NGO Network for Development (ANND), the Center for Economic and Social Rights (CESR), Development Alternatives with Women for a New Era (DAWN), Global Policy Forum (GPF), Public Services International (PSI), Social Watch, Society for International Development (SID), and Third World Network (TWN), supported by the Friedrich Ebert Foundation. It provides the most comprehensive independent assessment of the implementation of the 2030 Agenda and its Sustainable Development Goals (SDGs). Reclaiming policies for the public. on sustainability and inequality - assessments and alternatives.